Throughout our lives we encounter problems we find hard to understand or resolve. We create these problems in ways that are uniquely structured to our personalities, which means that the solutions have to arise from the same uniqueness. We do this by tapping into the reservoirs of our own wisdom. The Grovian facilitator is a catalyst in, not a controller of, this process, supporting people to retrieve the information they need in a process of self-discovery that leads naturally to self-reorganization. The information needed to effect self-organized change is literally 'in-formation' - that which is found or formed from within. It is neither planted nor suggested by the therapist or coach. New information changes the brain, it changes behaviour, and it changes lives. David Grove called self-generated information the data that makes a difference. It is our inner intelligence at work. How do we tap our inner intelligence? Clean Input: the Power of Six questions are minimally-assumptive, non-suggestive and influence-free. Present Tense: Power of Six questions, client information and experience, are all in the here and now. Adjacent Spaces: new information is accessed in and emerges from a network of adjacent body~mind spaces. Iteration: each client response to the Power of Six questions informs the next response in the sequence until new knowledge emerges. Formula: a simple formulaic procedure drives the process, which allows the client to concentrate exclusively on themselves. 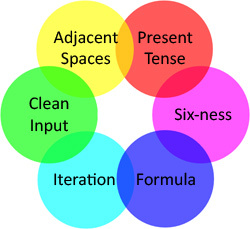 Six-ness: each of the six numbers has a unique role to play in the network while interacting and integrating to operate as a whole. The first two conditions - Clean Input and Present Tense - are common to all Clean processes. The third, fourth and fifth - Adjacent Spaces, Formula and Iteration - are shared with Clean Space and Emergent Knowledge in general. All six conditions are present in the Power of Six. Six-ness is exclusive to it. More about how these six elements work together can be found elsewhere on the site. What led to Emergent Knowledge and the Power of Six? Clean Language originated with Grove in the late 80s through to the mid 90s. It taught facilitators how to keep their questions non-assumptive, non-suggestive and non-interpretive - 'clean' - in order to allow the client to access their subjective experience with minimal interference. Clean questions do not introduce ideas to the client, but encourage the client's own model of the world to emerge. Therapeutic Metaphor uses Clean questioning to elicit and develop the verbal and non-verbal symbols and metaphors people generate intuitively. Metaphors are the royal route to the unconscious. Intergenerational Healing utilizes the biographical and genealogical information released by Clean questioning to generate resources for the relief or resolution of historical problems. Symbolic Modelling is Lawley and Tompkins' definitive model of Grove's work in Clean Language, Therapeutic Metaphor and Intergenerational Healing. Clean Space developed in the late 90s, based on a realization by Grove that valuable information was to be found in the internal and external body~mind spaces clients occupied, rather than focusing solely on the linguistic constructions they employed. Our fixed perceptions of therapy as a static dialogue between therapist and client following conversational rules changed rapidly and dramatically. The therapist became a facilitator, freeing the client to move, to seek out physical positions equating to mental spaces containing what had previously been inaccessible or intractable information. Space became psychoactive, and therapy took on a new dimension. How did Emergent Knowledge emerge? Grove was inspired by the new science of emergence. He worked on the notion that adjacent information spaces would network together, and that from their iteration and integration new knowledge would emerge with minimal input from the facilitator. The repetition of a single question drove an algorithm of change that prompted a systematic restructuring of the client's personal cosmology in which the old stuff - fear, guilt and so on - self-reorganized into a more manageable form, and in some cases ceased to exist altogether. The techniques were formalized into a set of processes which became known as Emergent Knowledge. The processes condition the brain to learn from itself. The client's symptoms are encouraged to proclaim what they know, to reveal their strengths and weaknesses, to tap their reserves and to achieve their goals. This is done by forming a network of individual nodes of information, harnessing the iterative principles of emergence. In the beginning this was a generalized process. Grove realized it needed to be more specific, more focussed, and reproducible. He suggested there must be an optimal number of nodes or spaces to such a network. What is so special about Six? When Grove mooted six as the optimal number of spaces or items of information a client would require to network together there was a wealth of scientific evidence to back him up, but not everyone was convinced. Some of us imagined that six would turn out to be an average representing a very broad range, and that the actual number of steps required for new learning or change to emerge would vary enormously because of the limitless variety of human difference and the endlessly assorted ways people have of constructing and construing their problems. In fact the number has proved to be remarkably consistent, with little variation on either side. Now having facilitated and witnessed hundreds of applications of the formula by Grove, ourselves and others in seminars, clinics and private practice we can safely predict that most clients will need no more than six links to come up with the information required to resolve a wide variety of problems and outcomes. Most people are separated from a state- or life-changing experience by six steps, six degrees, six responses to a set of elementary questions. The simple syntax of the Power of Six has been called 'cleaner than clean' or Clean Language Mark II. If you would like to go further, register for articles and news. Now available, 'The Iterator', an on-line experience of the Power of Six.